Yesterday saw the release of the latest Blu-ray in Eureka’s Masters of Cinema collection (IMHO, they rival Criterion for sheer attention to detail and beauty). 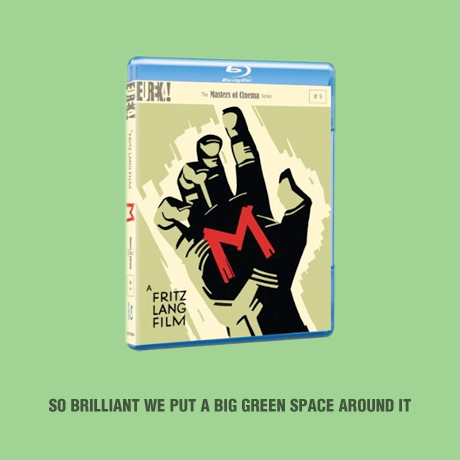 It’s Fritz Lang’s 1931 classic M and it’s now the best Blu-ray release I own. Every single aspect of this Blu-ray is perfect. Even the packaging is work of art, with a beautifully slimline and understated design encasing a totes wicked booklet and a firmly held disc. The menu is equally perfect and simple (I wish I could find a way to screengrab Blu-rays) and pops right up as soon as you put the disc in: no piracy warnings or studio idents here! The film is a master work of surprisingly accessible genius and it’s never looked and sounded so good.